Hospital noise is an issue for babies born prematurely who are at high risk when it comes to external influences such as noise. Their systems are underdeveloped and they need as much sleep and rest as possible to recuperate. 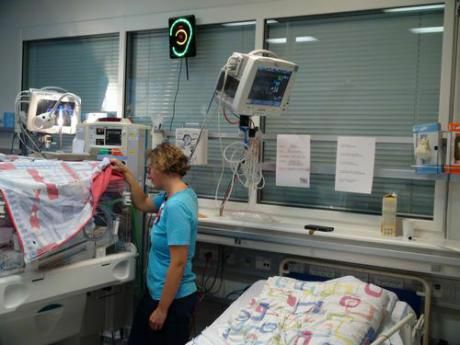 This is one of the reasons why the Neonatal Unit at the highly specialized hospital in Denmark, Rigshospitalet, began cooperating with the noise measurement company SoundEar this year. Staff at the Neonatal Unit stress that there is a difference between what they call ‘good sound’ and noise. The point being that not all sound is noise, and not all sound should be eliminated. It is important for the development of the newborns that they hear sound such as their parents and siblings talking and singing to them. It is also important that staff can communicate audibly in critical situations, and it is inevitable that some medical equipment, such as respirators, are noisy. What they do want to reduce is unnecessary sound stemming from alarms, furniture, work flow and talk. An important part of the project is to keep parents informed about why the noise meters are installed and not only focus on reducing noise, but also inform them that they should still talk to their newborns and that some medical care routines will result in a certain level of noise. One way of going about this has been to develop a flyer to hand out to new parents in the neonatal intensive care unit (NICU). See the flyer here . The aim is to bring down hospital noise levels at the NICU through installing noise meters in all rooms. Half of the noise meters are anonymous white boxes, which solely measure and collect noise levels. The other half of the noise meters also have a display with an ear, that lights up green, yellow or red, indicating the current level of noise in the room. The noise meters with displays should help staff and families become aware of their own noise levels and change their noisy behaviour. The software helps staff become aware of when and where noise levels are critical and something should be done differently. The software sends out noise reports on a weekly basis via email to key staff members, who use these reports as a basis for further discussion about noise at staff meetings. After having the SoundEar devices hanging in the NICU for a few months, staff was asked to fill out a questionnaire about the perceived hospital noise levels, and whether the SoundEar devices seemed to have changed anything. 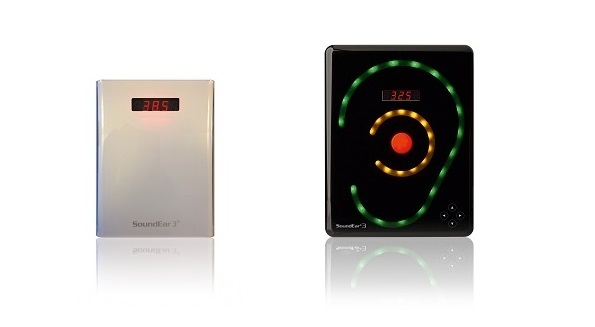 14 staff members, primarily nurses, answered the questionnaire and 78.6 % reported that the SoundEar devices had made them more attentive to noise levels. The same amount reported to have changed some of their behaviour because of the SoundEar devices. The change that most staff members reported to have made, was to unpack syringes and other types of medical equipment outside of patient rooms, because they had noticed that the ripping of plastic made an unnecessary amount of noise around the children. Others reported lowering their voices and lowering the noise level of alarms as changes they had made after the installation of the SoundEar devices. Several staff members also reported to have seen an increase in parents’ attention to noise levels, and that they commented on noise to other visitors and siblings, thereby spreading the attention to noise. All the noise meters transfer noise measurement data wirelessly to a central computer, where it is accessible to staff through a piece of software, developed specifically for hospital use by SoundEar in cooperation with staff at the NICU. An important part of the project was to create a system that would help reduce hospital noise and become part of the daily routine at hospitals. For SoundEar, this meant focusing on what staff needed and what their everyday work life looked like and adjusting to that. In the early days of the project, SoundEar viewed the software platform as the main component of the system and something that staff should be able to interact with daily. They should monitor noise levels just as they were used to monitoring the health levels of the newborns. To make the software as useful as possible, SoundEar conducted several interviews with staff members. Very soon, it became clear that even though nurses viewed reducing hospital noise as important, their focus was on the critical medical care for the newborns and keeping them alive and well. Their time was limited and they would not be able to prioritise time from their busy schedules to consult a piece of software that did not have immediate medical importance for the children. Instead, they suggested that a few members of the staff should be responsible for driving the hospital noise reduction; looking at the software and gathering insights for the rest of the staff to discuss at weekly meetings. Along the way, this insight turned into auto-generated noise reports being sent to key staff members to be discussed at staff meetings on a weekly basis. A noise-reduction program in a pediatric operation theatre is associated with surgeon’s benefits and a reduced rate of complications: a prospective controlled clinical trial. This entry was posted in Case story, Hospital case, Noise and health, Noise measurement, Noise reduction, Wireless and tagged neonates and noise, noise at hospitals.